We'd like introduce you to the new format of our monthly update. Each month we'll be bringing you the latest blog posts, website content, event information, upcoming opportunities and our good news round-up from over the last month. Think of a first meeting with an MP as the planting of a seed. You establish a good rapport and a sense of trust that you are someone they could work with. That might be all you manage. Next, you may invite them to speak in your local school when they'll hear why climate matters from those who stand to be most impacted. Find out more about our schools workshops here. Next, you might write to your MP asking them to submit a Parliamentary question about a topic they showed a particular interest in during the schools workshop. Perhaps it will be air pollution, flooding, housing insulation or transport? Their interest in that topic will be made known to their colleagues and the relevant department may have to formulate an answer to a flaw they had not thought about before. Your MP themselves might learn something, or maybe they won't be satisfied with the answer. Find out more about about our resources for writing to your MP here. What might be the next step? Maybe your MP will join a relevant interest group (APPG) in Parliament to learn more about how they can take action. Maybe they will become an advocate in the local community, organising local events with you and meeting with local Councillors. Maybe they will call a Parliamentary debate or submit an Early Day Motion to gain other MP's support for the cause. 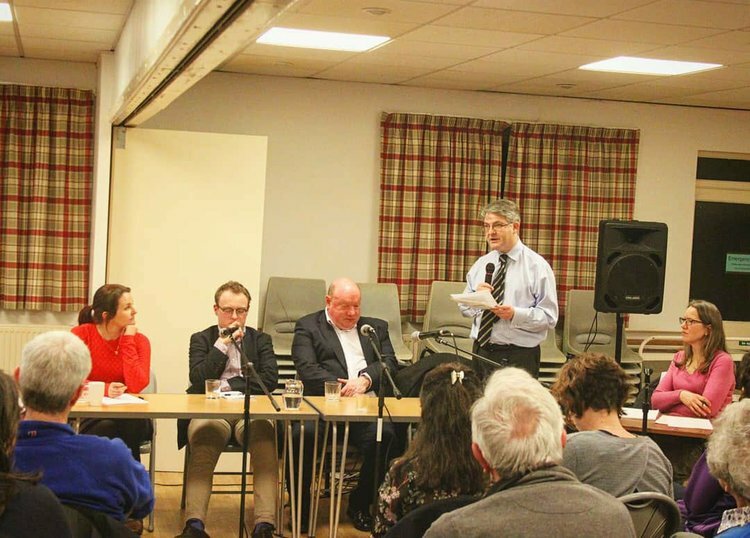 Read about one constituent's amazing work with Conservative Bernard Jenkin here, or about our most recent work with renown climate sceptic, Philip Davies here. Each relationship will develop differently but if you choose to work with us, we will be with you every step of the way. Carbon dioxide emissions in the UK have fallen by 2.6% in 2017 meaning they are at their lowest levels in 128 years! 25 of the UK’s largest retailers move towards meeting the UN Sustainable Development Goals. Scientists believe that nuclear fusion power could be operational within 15 years. This would go a long way to creating a reliable form of zero-carbon energy. Forest Green Rovers FC have won the first Green Heart Hero Sustainability in Sport award, organised by the Climate Coalition. Hope for the Future has been funded by Scurrah Wainwright to offer free workshops to schools in Yorkshire. While the workshop will be particularly relevant for Geography and Politics students, other subjects will certainly benefit from it too. You can read a blog about a recent workshop here. Our briefings contain some background into the 'problem' surrounding an issue. This month we've been focusing on fuel poverty. I'm interested in tackling climate change. Why should I talk to my MP about fuel poverty? The refurbishment of our homes and buildings is one of the greatest opportunities we have to reduce the UK's carbon emissions. The UK's housing stock is amongst the least energy efficient in Europe and is responsible for nearly a quarter of our annual carbon emissions. Talking with your MP about fuel poverty addresses the issue of climate change in an alternative and creative way, engaging MPs who have a wide range of interests. Read the full briefing on fuel poverty here.